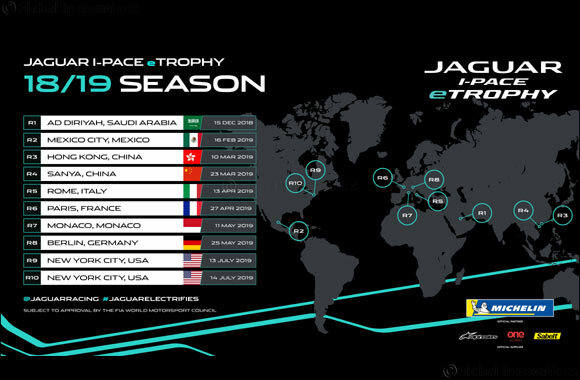 Dubai, United Arab Emirates, 12 September 2018: Jaguar Racing has unveiled the full race calendar for the inaugural Jaguar I-PACE eTROPHY Championship. Up to twenty identical Jaguar I-PACE eTROPHY racecars will line up on the grid on Saturday 15 December in Ad Diriyah, Saudi Arabia, for the first round of the new global electric production car racing series. The Jaguar I-PACE eTROPHY race will take place before the main Formula E race on the same city circuits, throughout the 2018-19 season and beyond. The series, a world first, offers teams the chance to showcase driving talent and electric performance in some of the world’s most exciting cities.